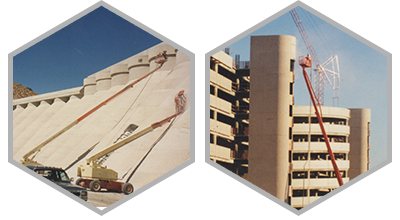 We are a portable sandblasting contractor in Los Angeles serving the entire state. Whenever you need sandblasting work in California, trust our company. Our team uses portable equipment and utilizes years of hands-on experience to ensure the effectiveness of each service. We are specialists in commercial and industrial sandblasting service and fully prepared to help you at your convenience. Call Sandblasting Solutions not just for services in the Los Angeles area but in the entire state. Want to clean a brick wall in a warehouse? Need paint removal? Traffic stripes removal? Steel sandblasting? We work on most surfaces ranging from stucco and steel to concrete and wood. Experienced and properly equipped, the pros can remove grease, paint, rust and any foreign matter either to clean the surface or prepare it for a new coating or re-stucco. In order to provide effective portable sandblasting service, our LA experts come equipped with the right machinery. They utilize their expertise in order to do their job right but also safely. It takes expert training and years of on the job experience in order to sandblast properly. Our intention is to serve our customers without causing harm to the environment or on-site accidents. For that, our pros are dressed properly and take all necessary measures for safe service. The mobile sandblasting service is not offered in haste. It is done with accuracy to ensure excellent results. Since our company is fully equipped and knowledgeable, each and every service is done with great precision and attention to detail. Whether you want a small or big job, we are at your service. The job is always supervised by a professional portable sandblasting contractor who sees that it is completed to the full satisfaction of the customer. Rest assured that every single pro on our team is qualified and chosen for his craftsmanship skills and personal values. We aim for excellence and keep updated with all innovations in order to use the best equipment and techniques for the most effective results. Call to make an appointment with our Los Angeles portable sandblasting contractor for superb results and safe services.